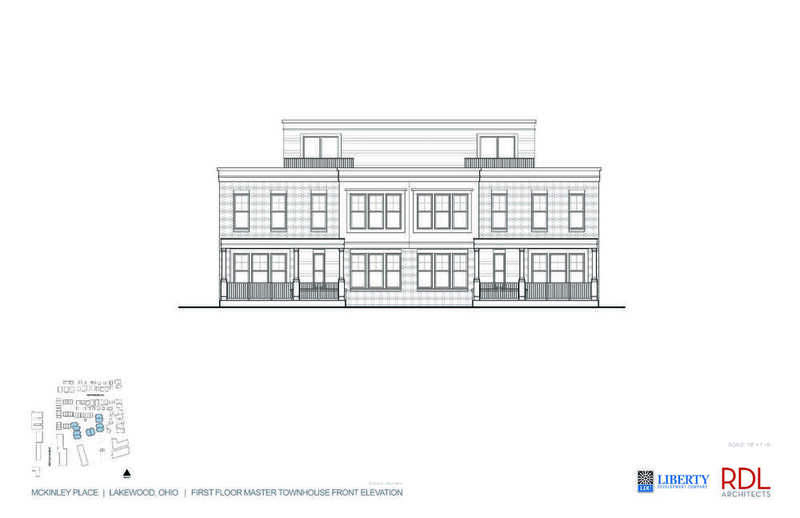 These classically-inspired new homes are a mix of ten First-Floor Masters and thirty Traditional Townhomes, ranging from 1,700-2,600 square feet. 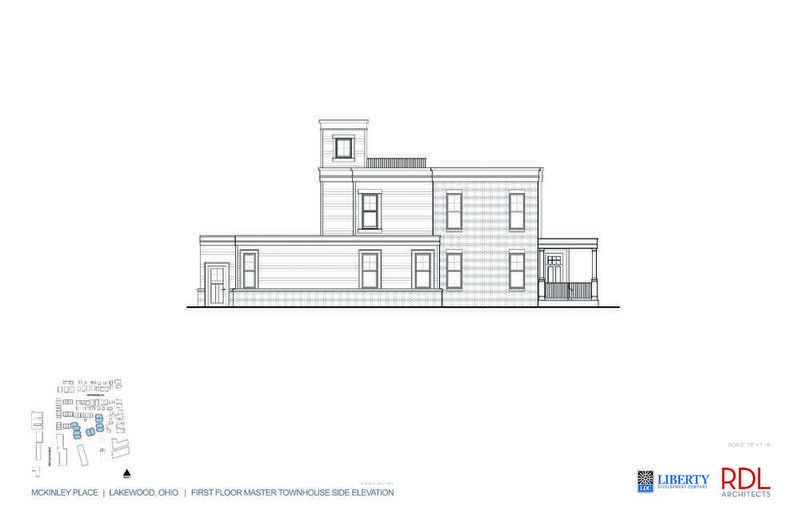 Inspired through the classical form and scale of a typical Lakewood bungalow. Between 2,240 and 2,570 square feet, these First-Floor Masters are exclusively designed for todays single-floor living. 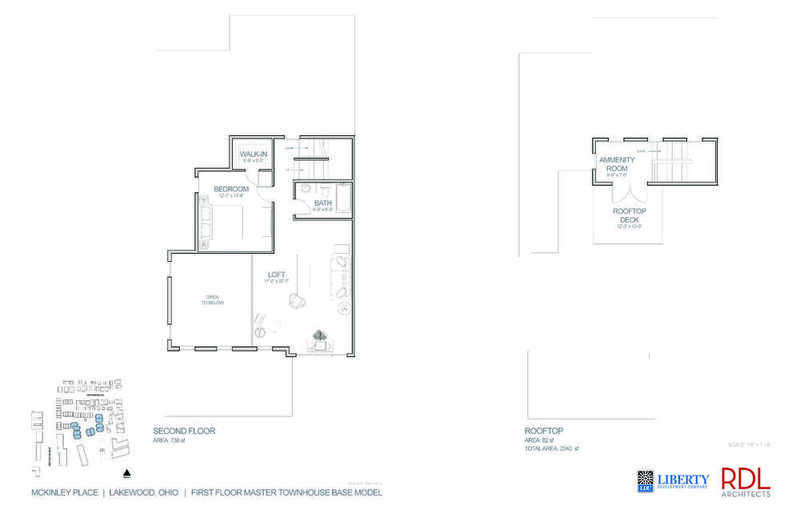 Ground floor layouts include large Great Rooms with adjoining dining and kitchen areas. 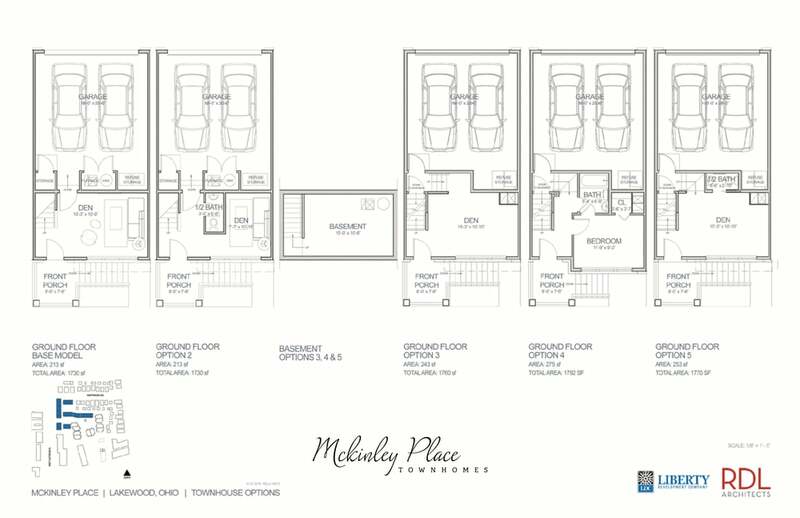 Ground floor master suites with attached garages allow for easy access into primary living areas. Upper floors offer optional loft space or an additional bedroom—which can be used as either a flex space, den or office. 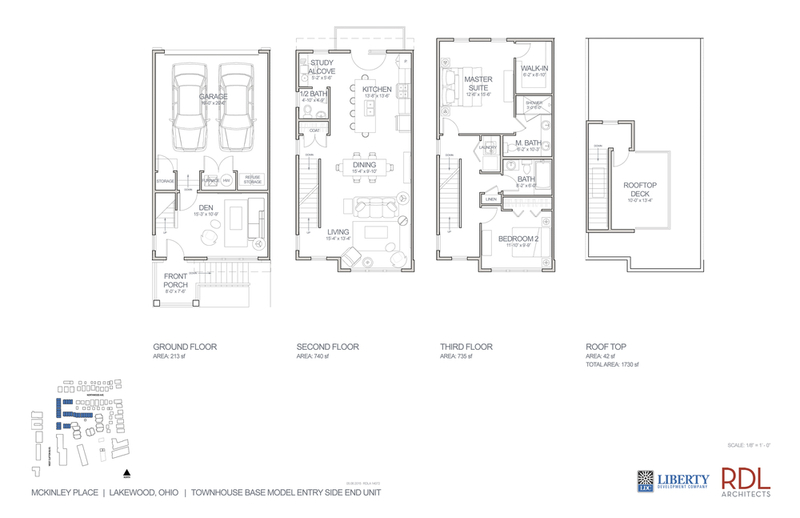 First-Floor Master Bedroom plans offer the flexibility to have either a three-bedroom, two-and-a-half bath or three-and-a-half bath—with the ability to walk up to rooftop decks. 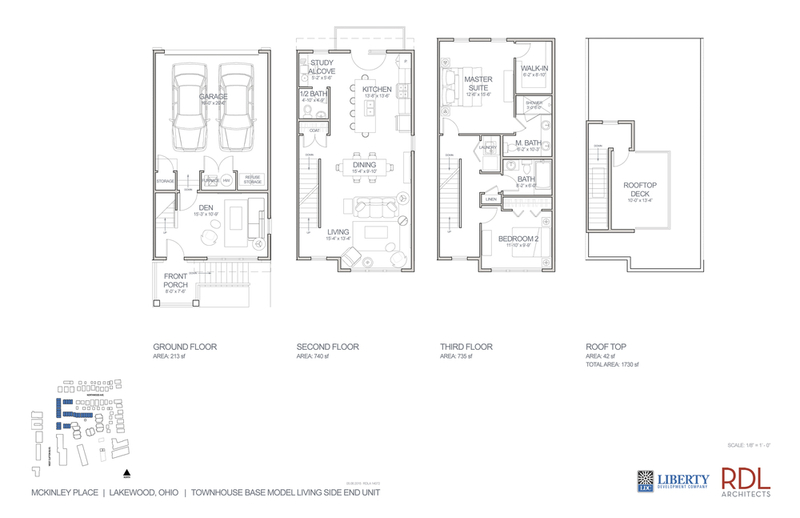 Efficently designed open floorplans create units that “live large” without much wasted space. Sustainable townhome construction and design techniques provide healthy and energy-efficient living and year-round comfort. 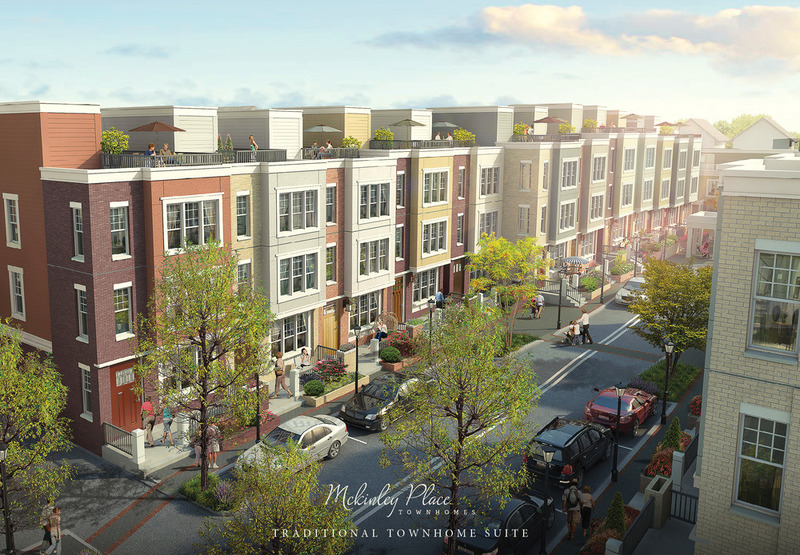 McKinley First-Floor Master Townhomes—Inspired through the classical form and scale of a typical Lakewood bungalow. Between 2,240 and 2,570 square feet, these First-Floor Masters are exclusively designed for todays single-floor living. 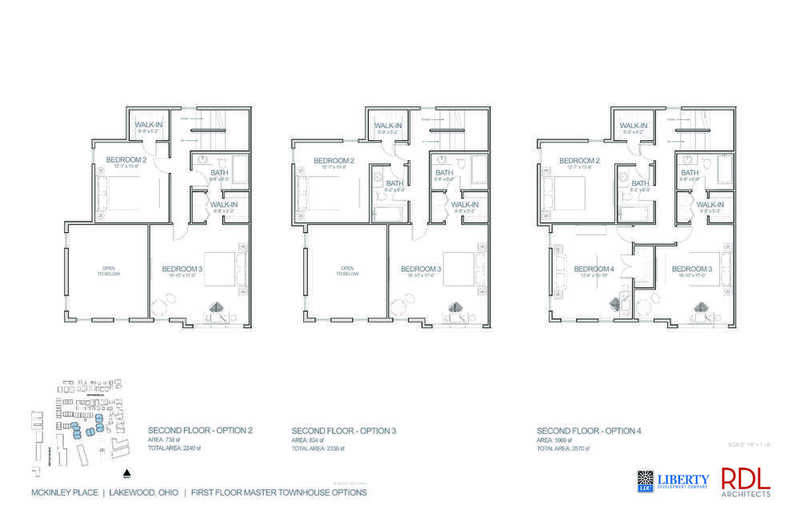 Ground floor layouts include large Great Rooms with adjoining dining and kitchen areas. 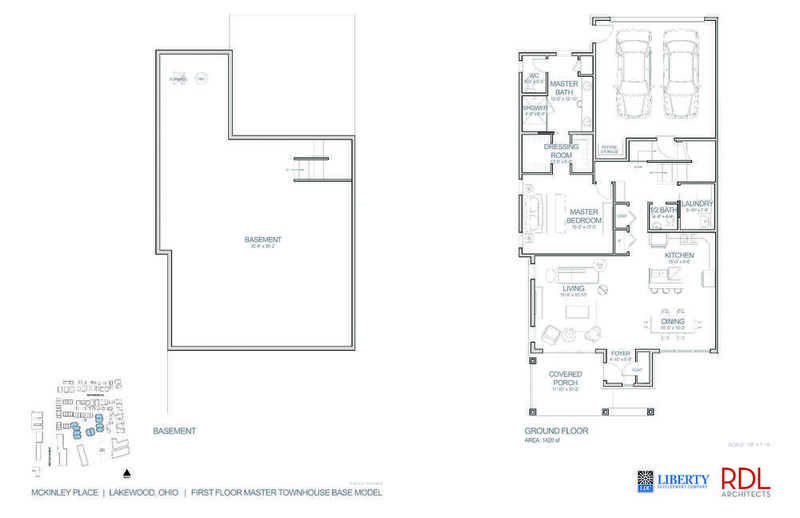 Ground floor master suites with attached garages allow for easy access into primary living areas. Upper floors offer optional loft space or an additional bedroom—which can be used as either a flex space, den or office. 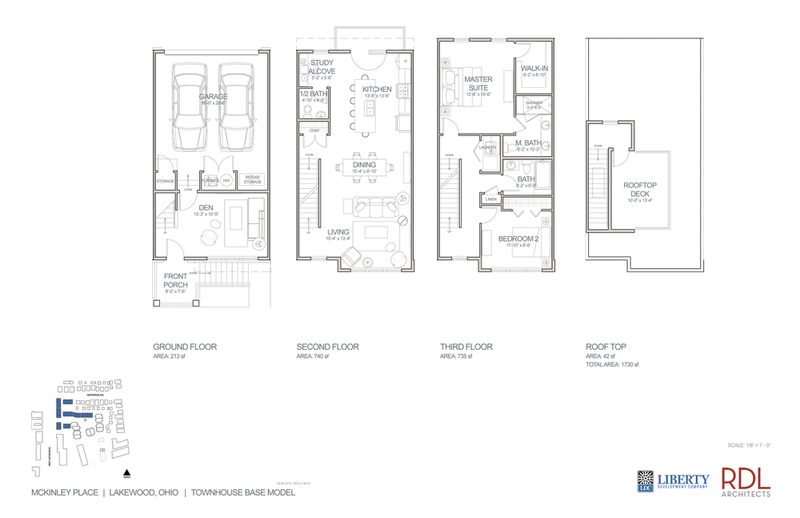 First-Floor Master Bedroom plans offer the flexibility to have either a three-bedroom, two-and-a-half bath or three-and-a-half bath—with the ability to walk up to rooftop decks. Efficently designed open floorplans create units that “live large” without much wasted space. Sustainable townhome construction and design techniques provide healthy and energy-efficient living and year-round comfort. 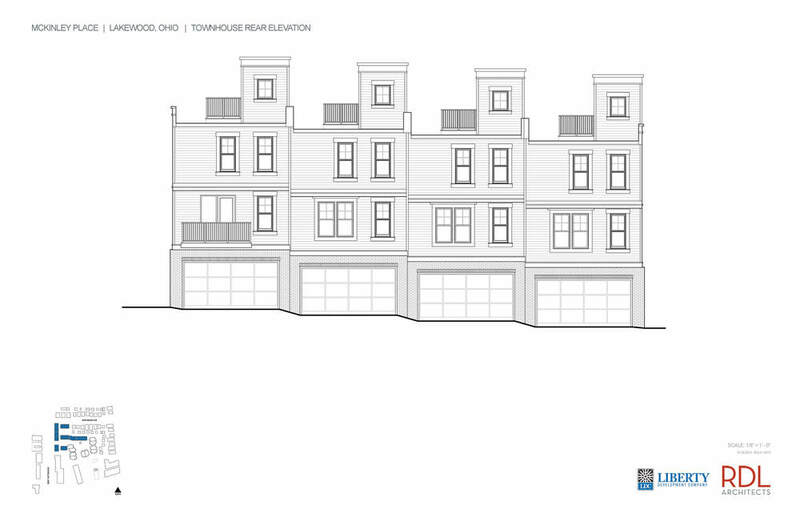 Generously sized at 1,730 to 1,818 square feet, three-tiered classic urban housing for the modern homeowner. 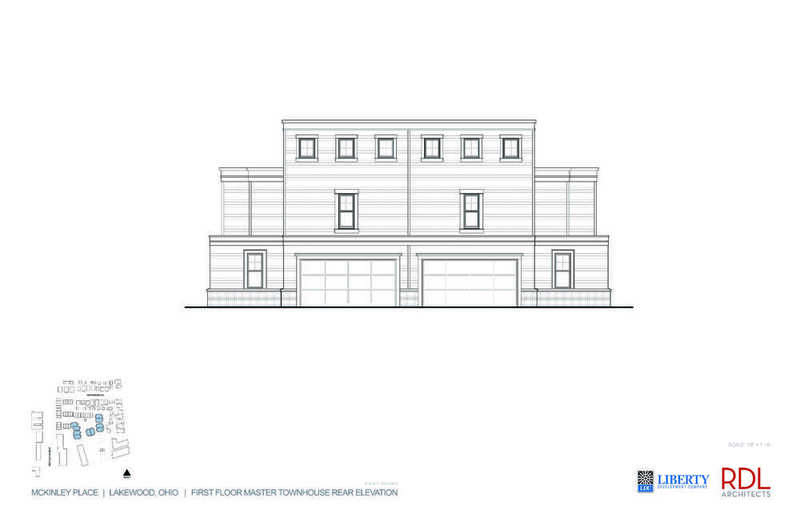 A ground-floor two car garage walks up to the first floor Great Room adjacent to the kitchen and dining areas. Expansive window designs overlook neighborhood streets and community greens. Ground floor flex rooms adjacent to the front entrance offer one the ability to customize floorplans to fit specific personal lifestyle and living needs. 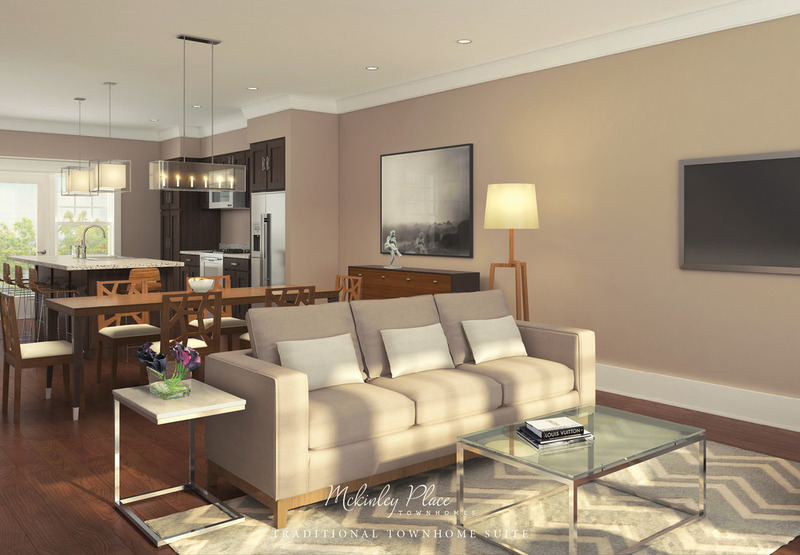 Two bedrooms in the upper tier of the townhome are both accompanied with generous bathroom suites. 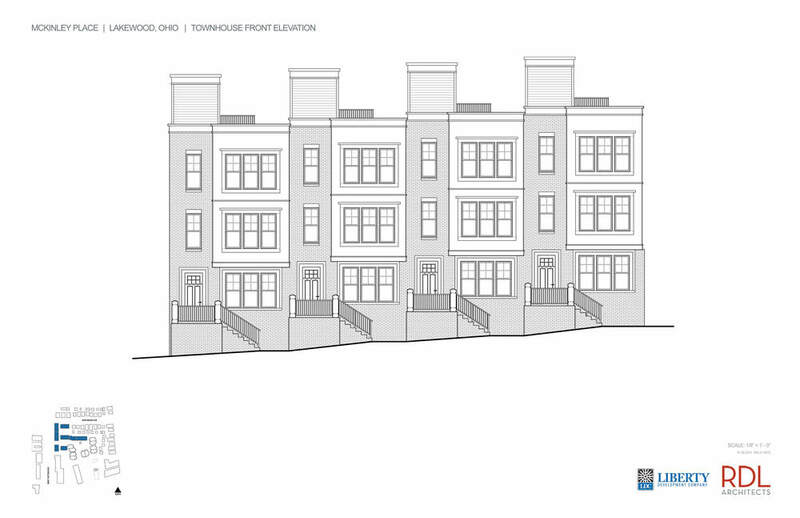 Finally, the rooftop deck level may include private terraces and/or outdoor kitchens. Additional flex space and storage are available with optional basements. 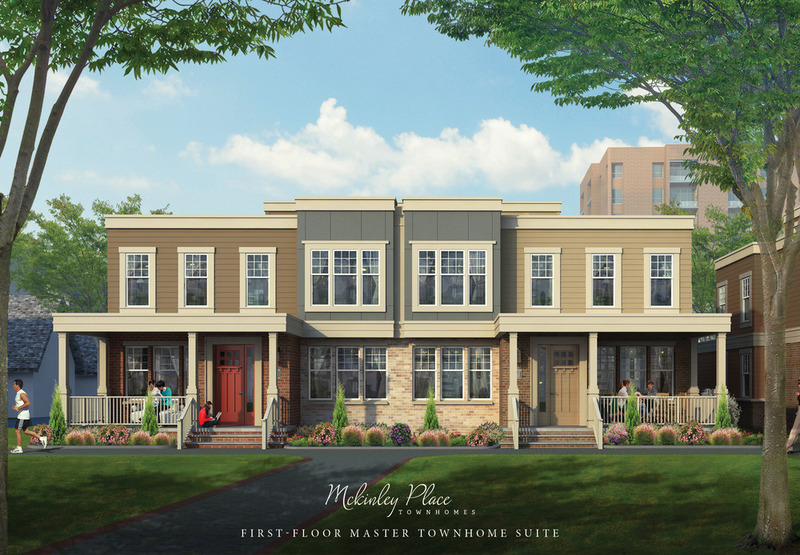 McKinley Traditional Townhomes—Generously sized at 1,730 to 1,818 square feet, three-tiered classic urban housing for the modern homeowner. A ground-floor two car garage walks up to the first floor Great Room adjacent to the kitchen and dining areas. Expansive window designs overlook neighborhood streets and community greens. Ground floor flex rooms adjacent to the front entrance offer one the ability to customize floorplans to fit specific personal lifestyle and living needs. 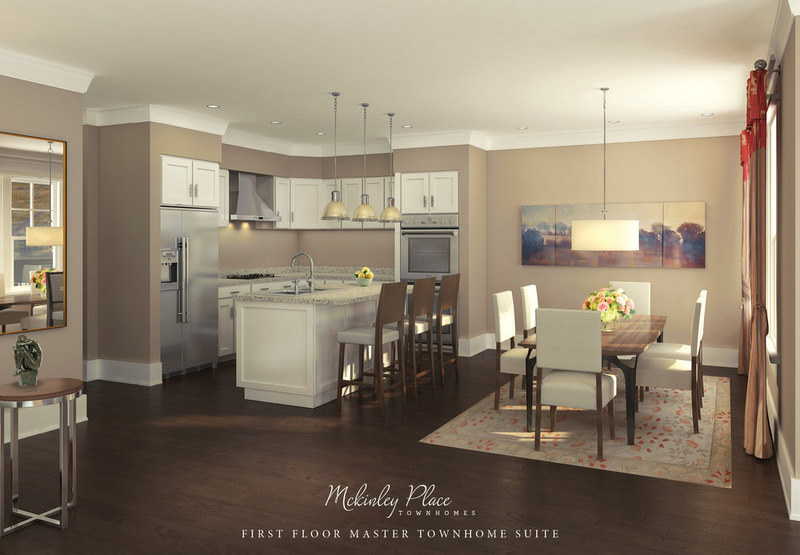 Two bedrooms in the upper tier of the townhome are both accompanied with generous bathroom suites. 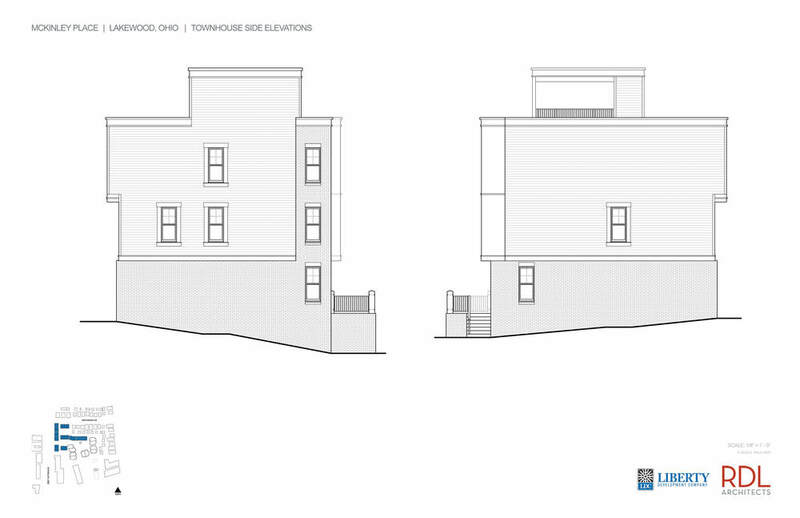 Finally, the rooftop deck level may include private terraces and/or outdoor kitchens. Additional flex space and storage are available with optional basements.